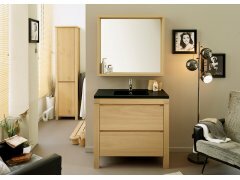 The RoomSmart Erwan Bathroom Collection is made of beautiful natural veneered oak. It is designer chic for modern contemporary, country, organic Zen, or urban sophisticated décor, and pairs well with your favorite color scheme. The 36” free-standing vanity cabinet is topped by a matte black glass sink and counter, and has two roomy drawers underneath for ample storage. A matching oak-framed mirror with narrow shelf sets off the vanity area to perfection. For even more storage space, just add the 6 foot tall storage tower, which has 6 large cubbies behind two oak doors. If you have just 4 ½ feet of wall space, you can easily install both pieces, giving your bathroom elegance, organization and room to spare! The natural oak vanity makes a sophisticated kitchenette or a free-standing bar as well, with the tall storage tower for glasses, bottles and bar supplies. Apartments, condos, studio apartments and smaller houses have one thing in common. Organized storage is essential; and, the sophisticated, classy look of the Erwan Collection is the perfect solution! A little touch of glass for your bathroom in the Erwan natural veneered oak cabinet. The matte black sink is set asymmetrically in the console creating a high contrast to the light-toned vanity base. Featuring two (2) sectioned drawers for keeping your essentials organized - the horizont.. Enjoy a tower for your shower with the Erwan tall storage piece made of natural veneered oak. Featuring five (5) cubbies with four (4) shelves concealed behind two (2) doors all helping keep towels & linens neatly at hand.Features:Erwan collection73" tall 2 door towerNatural veneered oak4 shelve..